The kelvin is the fundamental unit of temperature. But it came at the end of a journey that began long before thermometers even existed. The earliest attempts at gauging temperature used no fixed scale and no degrees. These proto-thermometers — which we now call thermoscopes — could be used only for comparing one temperature to another, or monitoring temperature changes, and not measuring an exact individual temperature. It wasn’t until the early 1600s that thermometry began to come into its own. The famous Italian astronomer and physicist Galileo, or possibly his friend the physician Santorio, likely came up with an improved thermoscope around 1593: A inverted glass tube placed in a bowl full of water or wine. Santorio apparently used a device like this to test whether his patients had fevers. Shortly after the turn of the 17th century, English physician Robert Fludd also experimented with open-air wine thermometers. Patient breathing into Santorio's thermoscope. 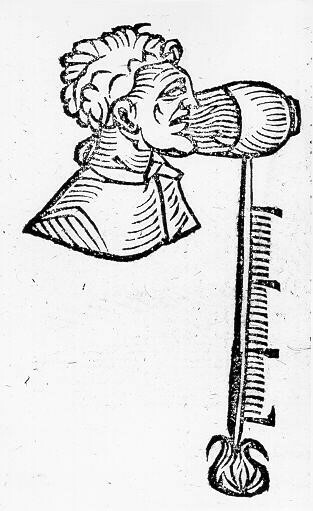 In the mid-1600s, Ferdinand II, the Grand Duke of Tuscany, may have realized that the results for these open-air thermoscopes were affected not just by temperature but also by air pressure. He designed a version of a thermoscope in which wine was contained within the glass tube that was sealed off by melting the glass at its base. Despite these improvements, there were still no “scales.” Each device had its own unique gradation. Renaissance manufacturers would often set the highest and lowest markings on a thermoscope to their reading on the hottest and coldest days that year. 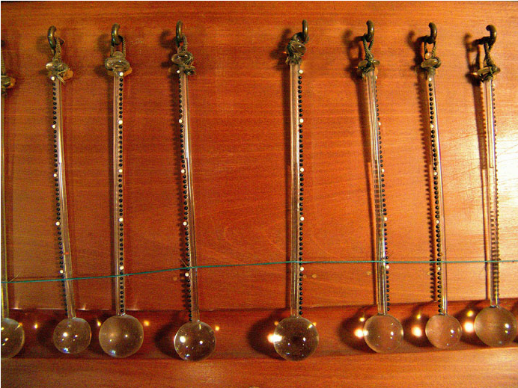 17th century thermometers from Italy. The invention of Rømer’s and Newton’s scales turned their thermoscopes into the world’s first bona fide thermometers, and interest in thermometry research exploded. After a visit to Rømer in Copenhagen, the Dutch-Polish physicist Daniel Fahrenheit was apparently inspired to create his own scale, which he unveiled in 1724. His scale was more fine-grained than Rømer’s, with about four times the number of degrees between water’s boiling and freezing points. Fahrenheit is also credited as the first to use mercury inside his thermometers instead of wine or water. Though we are now fully aware of its toxic properties, mercury is an excellent liquid for indicating changes in temperature. Originally, Fahrenheit set 0 degrees as the melting point of a solution of salt water and 96 as the temperature of the human body. But the fixed points were changed so that they would be easier to recreate in different laboratories, with the freezing point of water set at 32 degrees and its boiling point becoming 212 degrees at sea level and standard atmospheric pressure. Fahrenheit’s scale became hugely popular. It was the primary temperature standard in English-speaking countries until the 1960s and is still favored in a handful of countries including the United States. But this was far from the end of the development of important temperature scales. In the 1730s, two French scientists, Rene Antoine Ferchault de Réamur and Joseph-Nicolas Delisle, each invented their own scales. Réamur’s set the freezing point of water at 0 degrees and the boiling point of water at 80 degrees, convenient for meteorological use, while Delisle chose to set his scale “backwards,” with water’s boiling point at 0 degrees and 150 degrees (added later by a colleague) as water’s freezing point. With so many thermometry proposals floating around, there was confusion. Different papers used different scales, and frequent conversions were necessary. Into this mess stepped physicists who sought to create a scale based on the fundamental physics of temperature. Even as early as the 1700s, there were inklings of the concept of an absolute zero. French physicist Guillaume Amontons did some of the earliest work while studying what he perceived as the springiness of air. He noticed that when a gas is cooled down, it pushes back on a liquid with less force than when it is warm. He reasoned that perhaps there was a temperature so low that air would lose all its springiness and that this would represent a physical limit to cold. During the next 100 years, physicists including Amontons, Swiss-born J.H. Lambert, and French chemist and physicist Joseph Louis Gay-Lussac did extrapolations that set this absolute zero anywhere from -240 to -273 degrees Celsius. The scale that bears his name uses increments with the same magnitude as the Celsius scale’s degrees. But instead of setting 0 arbitrarily at the freezing point of water, the kelvin scale sets 0 at the coldest point possible for matter. The kelvin has been the preferred scale for scientists since 1954, when the General Conference on Weights and Measures (CGPM) — an international organization that makes decisions about measurement standards — adopted the kelvin (K) as the base unit for thermodynamic temperature. 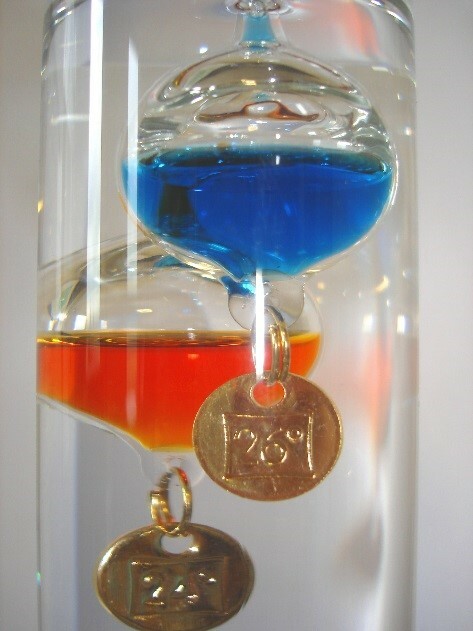 The CGPM set a reference point of 273.16 K as the triple point of water, at which water exists as a solid, liquid and gas simultaneously in thermal equilibrium. Since then, the CGPM has set several other reference points to improve thermometer calibration. For more information on the kelvin, see BIPM’s SI Brochure: The International System of Units (SI).